It was a happy weekend for the local fans as Alain Prost driving a Renault won the French Grand Prix. The win was slightly fortuitous as Prost had been lying second, seven seconds behind Nelson Piquet, when the race was stopped after 58 laps because of heavy rain. That was one lap shy of the 75% rule kicking in, which would have meant the race was deemed to have run its course. Renault took full advantage of the rain break, fitting super-soft tyres, turning up the turbo and even laying paper on the grid to soak up the water. 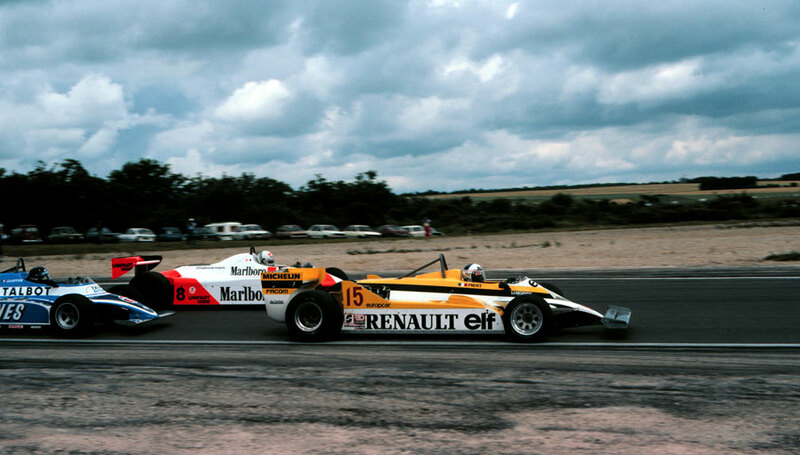 Prost and team-mate Rene Arnoux made superb starts as Piquet struggled for grip, and they led for the remaining 22 laps. When the aggregate times were released, Prost had his maiden victory with Piquet, down in fifth for the second stage, taking third. John Watson squeezed between the pair to finish on the podium for the second race running. Not everyone benefited from the delay. Carlos Reutemann, who had been in fourth when the race was stopped, came together with Hector Rebaque's Brabham and dropped through the field to finish tenth. Alan Jones had a better second race but his efforts were to no avail as he had made three pit stops in the first instalment. Gilles Villeneuve was again a moving road block in the early laps, and while that had been capitalised on to give him victory in Spain, all it did in France was to allow the first five to move almost a lap clear as the field bunched behind him as he held sixth until his Ferrari died on the 42nd lap.